One of the Ballymena area’s longest-running sporting leagues is set to benefit from the introduction of some fresh blood in the new season. That was the view expressed by Ballymena and Provincial League officials as the league held its annual dinner and awards night in the Michelin Athletic Club. Members of Cookstown Youth receive the Junior Division Two league winners' trophy from Phyllis McIlwee, of Michelin Athletic Club and the Canda Trophy from league assistant secretary Jane McIlrath. 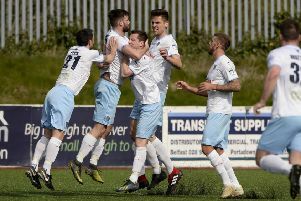 The league, which began its life as the Ballymena and District Junior League in 1948, has completed its 68th season in existence, the last 26 of which has seen the league play under intermediate status, as well as having three other junior divisions. The flagship intermediate division is set to be enhanced further in 2016-17 with the arrival of three teams who were relegated from NIFL Championship Two as part of a shake-up in its structure. Coagh United, Glebe Rangers and Ballymena-based Wakehurst will go head-to-head with an already strong line-up in the battle for league honours. Mr Fenton, who was elected to the post of President of the County Antrim Football Association last week, paid tribute to long-serving secretary Billy McIlroy, who remains the driving force behind the league and is recognised as one of the leading football administrators in Northern Ireland. Also among the guests was newly-elected Mayor of Mid and East Antrim, Councillor Audrey Wales, who said: “Mid and East Antrim has a strong sporting heritage and the Ballymena and Provincial League has played a significant part in the borough since 1948. “The league has seen tremendous growth over the years, from 12 clubs to 48, playing at junior and intermediate level. “I would like to thank those dedicated volunteers who have been involved in making this league and this evening a great success and who spend countless hours through the year, promoting football across the borough,” the Mayor added. Secretary Billy McIlroy added to that theme of volunteering when he urged players and officials of clubs to consider getting involved in the increasingly busy administrative operation carried out by a few individuals within the league. “Now is the time to take up the cudgels and say ‘I would be interested in doing that’. “Don’t sit back, give me a shout and you will be welcomed with open arms. “Where would football be without the grassroots people who are always there carrying out the chores like washing the kit, marking pitches and fund-raising? “They are certainly worth their weight in gold and to each and every one of them I would say a very big thank you as without them, football could very well die,” added Billy. On the pitch, the intermediate division was dominated by Limavady-based Newtowne FC, who claimed three of the pieces of silverware up for grabs.